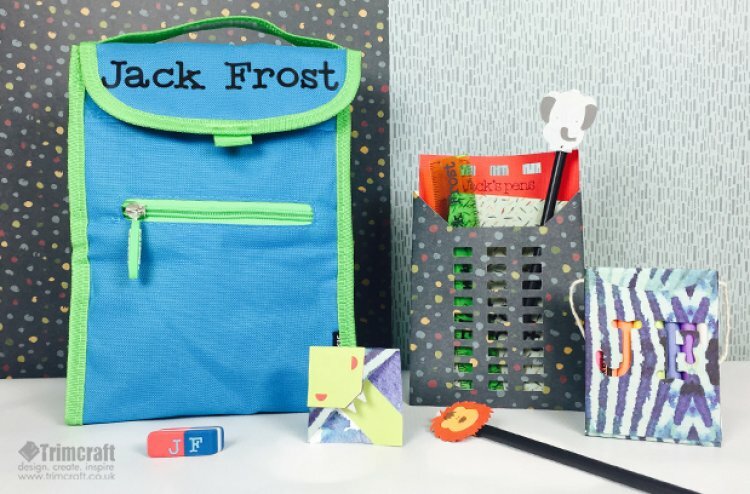 Our guest blogger Suzie Candlin from Cricut has made all these fun Back to School projects and shows you how to make them in her handy tutorials. 1. Sign into your Design Space™ account, switch on the Cricut Explore™ and ensure it is connected either by Bluetooth or USB cable to your pc/Mac.Search for and select the Design Space™ projects categories list for ‘parties & events’ and click on the ‘Picnic Utensil Pocket’ project. 2. Click on ‘Customise’. Hide the napkin ring layers and separate the layers for the holder. Resize the holder to be 11” x 6.5” and the insert to be 4.3” x 6.3”. 3. Click on ‘Add Text’ and type the name required. Select ‘has writing style’ and a font from the edit window. Position the text on the insert where required and ‘attach’ it to the insert. 4. Cut the images out from the First Edition Travel Notes paper and textured card stock, loading them on to the cutting mat and adjusting the Smart Dial™ accordingly and loading the scoring stylus and pen when prompted. Tip: Use the scraper tool to add the cut paper to the mat; ensures good adhesion and no air bubbles. Remove the paper from the mat using the spatula to prevent damage to the image and the mat. 5. Use the scraper tool to crease the folds in the stationery wallet. Glue the side panels together and to the bottom panel, ensuring that no adhesive spreads to close the wallet completely. 6. Slide in the named insert. Fill the wallet with stationery. You can also customise the contents of your stationery wallet with your Cricut Explore. 1. Click on ‘Add Text’ and type the name required. Select a font from the edit window. Copy and paste the name and initials as required and resize each copy to give a variety of sizes. Cut the text out from vinyl, adjusting the Smart Dial™ accordingly. Add your vinyl text to label the ruler, notebook, lunch bag and the eraser. 2. Cut the images using the First Edition Kaleidoscope paper, loading them on to the cutting mat and adjusting the Smart Dial™ accordingly and loading the scoring stylus and pen when prompted. Use the scraper tool to crease the folds in the crayon box. Glue the side panels together and to the bottom panel. To finish, feed some twine through the cut holes to create a handle. 1. Create a new project and click ‘insert image’. Pick the lion image from Animal Kingdom® Cartridge and the elephant image from ZooBalloo® Cartridge. Resize the images to be approximately 1.5” x 1.5” and cut the images out from textured card. 2. Glue the layers together and allow to them to dry. Wrap and stick a piece of coordinating textured card stock to the top of pencil and attach the toppers on top of the paper using a hot glue gun and glue sticks. 1. Create a new project in In Cricut Design Space™, using ‘insert image’, search a snake book corner. Cut the image from the textured card stock and the First Edition Kaleidoscope paper. Fold on the scoring lines and adhere the back flaps together. Layer and adhere the bookmark pieces to create the faces - the inside mouth pieces are attached to the inside of the folded back flaps. If you have a Cricut Explore™ machine, we would love to see your Cricut Explore™ makes in the project gallery. What Cricut Explore™ ideas would you like us to make?